Since various Communities in Europe have become a unified European State (at least since the Treaty of Lisbon) – it has been absolutely clear that this state-project cannot be maintained as it is, and as of today exists in an explicitly transitory form. The question of whether the European Union will survive longer than the 9th European Parliament is an open one. We are witnessing an accelerated process of change in the entire political system in Europe, as well as increased pressure from geopolitical and centrifugal factors, which the European project has never had to directly face and thus has not formulated an effective reaction to. In Western Europe, recent years have brought not only the growth of new forces and political movements. One example is that alternative political circles are growing in strength, although they are currently seen as marginal, such as Italian La Lega, German Alternative für Deutschland or the Freiheitliche Partei Österreichs of Austria, whose position is already nearly secure. We are also witnessing the dusk of old parties (like the traditional right and social democracy in France or Italy), replaced by amorphous new post-political structures, along with formerly marginal political positions reaching mainstream public discourse – with immigration politics at the top, along with the related but more fundamental issue of European identity. However, the changes in Europe today not only concern content and organizational forms, they are also related to implementing new political standards modeled on the so-called “representative democracy” of the United States. For decades, it seemed easy to identify the difference between the European and American political systems. Contrary to the emphasis put forward by many political scientists, the differences do not boil down to the distinction between a“Multi-party vs. a Two-party system“. It would have been more accurate to described European policy as based on continuity and complementarity, and the American system on alienation and polarization techniques. As a result, Social and Christian Democrats / Conservatives had replaced themselves in power in the Western European countries after World War 2: in America a strict divide between two opposing political ideas became a corrective steering movement, while European cars still rode in the same direction. Of course, the American cruiser was also moving toward a single goal set by the financiers regardless of who was at the wheel, but the passengers were easier to control if there was some pretence that those sitting in the front were pretending to engage in a life and death fight for the steering wheel. Currently, the American model is becoming more and more popular on the old continent. The essence of the Alienation-Polarization System is to ferment quarrels over every aspect of political life. Everyone who does not share the same views should appear as a traitor, vermin, non-human, worthy only of annihilation, or at least meriting permanent exclusion from power. This is what I mean by polarization. Alienation, on the other hand, affects all those who see the escalating level of aggression accompanying politics and permanently move away from it, which only facilitates the final implementation of replacing supranational organizations (which themselves took the places of national states that were formed on the rubble of non-national traditional monarchies) by the direct rule of corporations and bureaucracy. The transition from European “continuity” to the American “quarrel” is taking place alongside the growth, importance and popularity of new political forces, representing the tendency within European nations to constructing a realistic opposition against the Americanization of Europe. Who stands on the side of nations against the elites finds himself excluded from the “democratic” political world, which are then treated as rivals. He becomes an enemy who wants to reverse the course of history and opposes what is necessary, right and established long ago by the forces of globalism. Political processes taking place in the last century can be seen in a certain continuity, connecting them with seemingly small elements of contemporary politics. If we put changes in European socio-political consciousness on a coordinate axis, we would easily see the same direction for many vectors: a violent but consistent transition from the Traditional Monarchy to the Enlightened Centralism, which prepared a place for post-revolutionary Bourgeois Nationalism. This then spread efficiently to Central and Eastern Europe, through the phenomena of National Revival, leading to the destruction of the last traditional monarchies. However, after the next World War (with some disruption in the form of the Cold War and the Blocks System) – nationalism had to give way to supranational organizations – such as the European Union. This one admittedly constitutes itself as a fundamental denial of the idea of ​​a Nation State – but it cannot be considered as the culmination of the whole process, because it is just a transitional stage between the existing states and their expected anti-thesis. Considering the essence of the European Union and its current conditions, we must first of all note that, according to classical theories of ethnogenesis, it is not the nation that creates the state, but the state creates a nation. 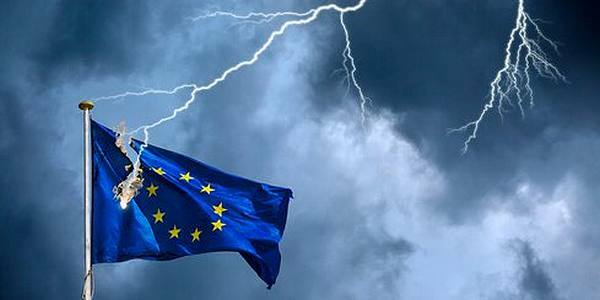 Having all the features of a state – the EU began to produce its political nation, consisting of the political emanation of the present dominant classes, the financiers and bureaucrats, jointly keeping power throughout the Western World. Let us emphasize that, of course, the ethnogenesis of the EU is a part of the process of globalization, but even a member of a very large mafia family knows that his importance is connected with the interests of his closest familiars and the control of even a small district. In this sense, the European elite communicate better with their American or Asian counterparts than with the proletarian and lower/middle classes in European societies. Yet, within certain limits, they try to defend their specificity, and thus also certain elements of European separateness, because it remains necessary to them. This need to exercise power, to continue and accelerate the ethnogenesis of “New Europe” – has led to Europe’s largest crisis in decades. The crisis of consciousness is slowly changing into a political crisis – and this means that it can also become a venue for institutional change. To strengthen and facilitate the stratification of the new political nation and the proletarian, the European elites have decided to bring millions of immigrants to Europe, assuming that, in one fell swoop, several things will be settled. First, on the economic level – it will sustain the local economy, especially the service sector and, above all, the already choked pension systems. Secondly, in the sphere of consciousness: it will be possible to quickly uproot newcomers (like their previous waves), which will make new residents vulnerable to indoctrination in the spirit of liberalism, political correctness, social atomization and the typical combination of shortage of time with excess consumption. And thirdly, there is the current political effects – terrorizing their own societies, thus getting their support for the next “anti-terrorist actions” and pursuing US and Israeli political goals, as well as consenting to the further reduction of Civil Rights via permanent surveillance, all while sanctioning the elites’ power by force. As it turned out – this experiment was only partially successful. Western societies indeed followed the anti-immigrant psychosis, but instead of giving even broader consent to governments to continue globalization processes because of that fear – people began to look for methods of self-defence. European elites have put in a lot of effort and resources to quelling national reactions. One example was the infamous case of Norwegian mass-murderer Breivik, where the government signalled their new message: “if you want to express your opposition to us, you have to be even more “anti-terrorist”, pro-American and pro-Zionist than that government itself, and then we will pretend to argue with you, for example, about immigration.” In the subsequent years there were more False Flag operations, including dozens of bizarre “terrorist attacks” in the capitals of the West. On the one hand, they were always useful to get closer to the strategic goals of the elites, but at the same time they stimulated anti-elite public sentiment. This loop is the key to understanding the political situation in Europe before the election of the 9thEuropean Parliament. The war-industrial complex currently ruling the United States seems determined to indicate to the European project they occupy a predetermined, subordinate and purely utilitarian position – and that US might eventually decide to end it altogether. To this end, Washington decided to use not only its traditional, somewhat worn-out tool of influence in the region, the United Kingdom, but also reach for its new political acquisitions – its Central European colonies like Poland, Romania and the Baltic States. BREXIT is not only a warning of the disorder in European political structures: tt was also a deliberately implemented example, designed to justify and embolden the natural centrifugal tendencies of the previous Eastern Bloc countries in the EU. The paradox is that as a result of several years of intense indoctrination, they have been the most enthusiastic about the integration processes, ignoring that in doing so they are perpetuating their own subordinate position in the markets as sources of cheap workers, as well as the whole baggage of waste, thievery and corruption accompanying the distribution of Western investment funds. Now, however, a change is developing – whether using natural Euroscepticism and Traditionalism (as in Poland), or stimulating conflicts with the Brussels elite (as in Hungary) or simply threatening everybody with immigrants (and Russia…) – Americans are animating their own Europe against Europe itself. Let’s keep in mind that in 2019, more than 1/7 of the MEPs will come from American colonies in Europe. It would not be much in a real parliament, but within a body that has little to do with real democracy or representation it could be an important factor of Washington lobbying. Efforts such as the Three Seas Initiative showcase the changing dynamics within the makeup of the EU. Taking into account all the factors outlined in this essay, the European Union will be unlikely to grow anymore: it is still unclear whether it will survive at all. The European Parliament which will be elected next year may be the last of its kind. For the first time the EP will be composed of large number of MEPs determined to at least slow down, if not stop and reverse, the processes of building a European state aimed at participation in globalization. The elites react by closing the ranks, partially taking over some populist slogans and animating their own, false populist movements, in order to control social dissatisfaction. Americans want to interfere directly and more strongly in European affairs, using their Central European vassals for this purpose. On the other hand, Washington’s stronger pressures is arousing negative reactions even among the European elites, still obedient to globalist principles, but wanting to protect their particular profits, including those from relations with Russia, China or Iran. This is only intensifying tensions. The foundations of the Europe Union are cracking, and it is already clear the alliance will not survive in its current shape. It must reform itself, find and recognize European identity, as an aggregation of separate national consciousnesses – or, break down under the weight of unsolvable contradictions, further stimulated by powerful neighbours and rivals. That is why these elections will be so important… particularly if they are the last.